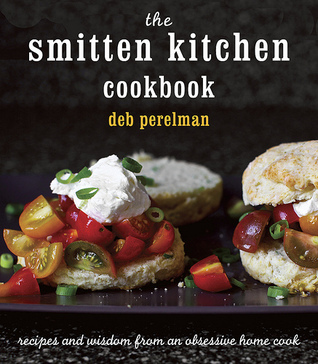 The long-awaited cookbook by Deb Perelman of Smitten Kitchen—home cook, mom, photographer, and celebrated food blogger. Deb Perelman loves to cook. It’s as simple as that. She isn’t a chef or a restaurant owner—she’s never even waitressed. Cooking in her tiny Manhattan kitchen was, at least at first, for special occasions—and, too often, an unnecessarily daunting venture. D The long-awaited cookbook by Deb Perelman of Smitten Kitchen—home cook, mom, photographer, and celebrated food blogger. Deb Perelman loves to cook. It’s as simple as that. She isn’t a chef or a restaurant owner—she’s never even waitressed. Cooking in her tiny Manhattan kitchen was, at least at first, for special occasions—and, too often, an unnecessarily daunting venture. Deb found herself overwhelmed by the number of recipes available to her. Have you ever searched for the perfect birthday cake on Google? You’ll get more than three million results. How do you choose? Where do you start? What if you pick a recipe that’s downright bad? So Deb founded her award-winning blog, smittenkitchen.com, on the premise that cooking should be a pleasure, and that the results of your labor can—and should be—delicious...every time. Deb is a firm believer that there are no bad cooks, just bad recipes. She has dedicated herself to finding the best of the best and adapting them for the everyday cook—the ones with little time to spare, little money to burn on unpronounceable ingredients, and little help in the kitchen. And now, with the same warmth, candor, and can-do spirit her blog is known for, Deb presents her first cookbook—more than 100 new recipes, plus a few favorites from her site, all gorgeously illustrated with hundreds of Deb’s beautiful color photographs. The Smitten Kitchen Cookbook is all about approachable, uncompromised home cooking: stepped-up comfort foods, stewy dishes for windy winter afternoons, an apple cake that will answer all questions: “What should my new signature dessert be?” “What is always welcome at a potluck?” “What did Deb consume almost single-handedly a week after having a baby?” These are the recipes you bookmark and use so often they become your own; recipes you slip to a friend who wants to impress her new in-laws; and recipes with simple ingredients that yield amazing results in a minimum amount of time. Deb tells you how to host a brunch and still sleep in—plus what to make for it!—and the essential items you need for your own kitchen. From salads and slaws that make perfect side dishes (or a full meal) to savory tarts and pizzas; from Mushroom Bourguignon to Pancetta, White Bean and Swiss Chard Pot Pies; from Buttered Popcorn Cookies to Chocolate Hazelnut Layer Cake, Deb knows just the thing for a Tuesday night, or your most special occasion. I am giving this cookbook 5 stars not only because it was an excellent cookbook with easy directions and colorfully detailed pictures, but because it made me want to attempt to bake again! I will admit right now that although I do enjoy cooking, a baker I am not, and it is only once a year that I will attempt to bake even a dozen cookies. This book, however, changed all of that. I first requested this book (I must mention that I received this wonderful cookbook through a goodreads giveaways conte I am giving this cookbook 5 stars not only because it was an excellent cookbook with easy directions and colorfully detailed pictures, but because it made me want to attempt to bake again! I will admit right now that although I do enjoy cooking, a baker I am not, and it is only once a year that I will attempt to bake even a dozen cookies. This book, however, changed all of that. I first requested this book (I must mention that I received this wonderful cookbook through a goodreads giveaways contest) after spending months salivating over Mrs. Perelman's recipes featured in her blog. I was interested not only because her food looked good and tasty, but also because I noticed quite a few Russian influences in her cooking (I believe her husband is Russian). This caught my attention and once I received her book and started out testing her recipes, I became an instant fan of hers. One thing that I love about this cookbook is the sheer number of beautiful photographs of food; I love being able to see what the recipe looks like before I decide to make it myself. Almost every recipe in this book has a picture of it - just looking at them make extremely hungry. As I mentioned before, I despise baking, but after looking at all those scrumptious pictures, I decided to try a couple of recipes - with very good results! The Cranberry Crumb Bars were very easy to make and were a huge hit at my house, perfect for a holidays dessert. Another recipe that was absolutely fabulous was the Gooey Cinnamon Squares; they were a bit time-consuming, but the results were fantastic, my husband at ALL of them in one day. Because of this, I am now more confident in my baking skills and will soon tackle the Golden Sheet Cake with Berry Buttercream recipe. http://www.seriouseats.com/2015/10/ho... my favorites, things that made my eyes widen when I tasted them buttered popcorn cookies* cheddar swirl breakfast buns** wild rice gratin with kale, carmelized onions, and baby swiss*** balsamic and beer-braised short ribs with parsnip puree**** harvest roast chicken with grapes, olives, and rosemary Chocolate Peanut Butter Cookies Tomato Scallion shortcakes w whipped goat cheese Broccoli slaw Red Wine Velvet Cake Zucchini ribbons with almond pesto *I switched the co http://www.seriouseats.com/2015/10/ho... my favorites, things that made my eyes widen when I tasted them buttered popcorn cookies* cheddar swirl breakfast buns** wild rice gratin with kale, carmelized onions, and baby swiss*** balsamic and beer-braised short ribs with parsnip puree**** harvest roast chicken with grapes, olives, and rosemary Chocolate Peanut Butter Cookies Tomato Scallion shortcakes w whipped goat cheese Broccoli slaw Red Wine Velvet Cake Zucchini ribbons with almond pesto *I switched the cookie sheets on the oven racks halfway through. **"In the test run, the buns ended up smelling reeeeeally onion-y, like an onion bagel. I'm going to try squeezing the juice out of the onions and see if that makes it milder. ---------------------- 1) Use more cheese, at least 8oz but it could tolerate even more. 2) Squeeze the onion of its water, a little like latke prep, unless you like that very strong onion bagel aroma/flavor but it does overwhelm the cheese. 3) It really does take 2 rounds of 2 hour risings to get that loft. So much time. 4) I tried different rollout thicknesses. The initial run had a rolled out rectangle of about 16x24 and the 2nd run had the specified 12x16. The recipe was right on this one. Having the soft thickness of bun was a very good situation. Too thin and it was still tasty but not as good of a bite&chew experience." ***"If I made this again, I'd mix in a different cheese along with the Swiss which seems to be much less oily than I'd expected. I'd cut the breadcrumb amount by half or mix in some cheddar before sprinkling it." ****"1) If you think you'll save time by browning on high heat, prepare by disengaging your smoke detector and having your place smell like burned beef fat for a couple days. If you have the time, sear them a little more slowly on med-high heat. 2) The braising liquid reduction was very, very strong. I wasn't a fan. 3) Oh god, that parsnip puree was glorious. Do yourself a favor and make it by itself." I don't think I had ever read a cookbook cover-to-cover before this one, but Deb Perelman's book is as addictive as her blog. I want to make EVERYTHING but so far have only made the 'sweet peas and shells alfredo,' which were easy and delicious. This is really everything a good cookbook should be: clear, realistic, AND aspirational. I also appreciate that Deb keeps her stories light and her humor self-deprecating - it's a cookbook not a memoir, after all. Another thing - the book is even prettie I don't think I had ever read a cookbook cover-to-cover before this one, but Deb Perelman's book is as addictive as her blog. I want to make EVERYTHING but so far have only made the 'sweet peas and shells alfredo,' which were easy and delicious. This is really everything a good cookbook should be: clear, realistic, AND aspirational. I also appreciate that Deb keeps her stories light and her humor self-deprecating - it's a cookbook not a memoir, after all. Another thing - the book is even prettier without the dust jacket, which I LOVE because who wants to deal with a dust jacket in a kitchen anyway? I have been following the smitten kitchen blog for years and have made several of Deb Perelman's recipes, a few of which have become staples in our house—mushroom bourguignon, roast chicken with dijon sauce, lemony zucchini goat cheese pizza—and I can't wait to dig in to even more here in her cookbook. It is about two-thirds savory, one-third sweets, and all of it looks absolutely delicious. Perelman has a warmth and familiarity in her communication, and a way of making you feel welcome in her w I have been following the smitten kitchen blog for years and have made several of Deb Perelman's recipes, a few of which have become staples in our house—mushroom bourguignon, roast chicken with dijon sauce, lemony zucchini goat cheese pizza—and I can't wait to dig in to even more here in her cookbook. It is about two-thirds savory, one-third sweets, and all of it looks absolutely delicious. Perelman has a warmth and familiarity in her communication, and a way of making you feel welcome in her world, as though you are another close friend. The full-color photos are gorgeous, and the layout of sections is cohesive. Her recipes are clear and surprisingly unfussy (considering she defines herself as being obsessive!). Well, Perelman has gone through all the fussy testing for her readers, so they may make these recipes with less hassle. However, most of the recipes are not for total beginners, and many take some time. Every one I have made so far have been totally worth it, though! So many great recipes in this book! And bizarrely, the ones that caught my eye were all savories, and mostly salads, at that. The chocolate brioche pretzels look amazing, though. Wonderfully put together with a great blend of pictures and recipes and a little blurb of text for each recipe. If you like the blog, you'll love the book. If you haven't read the blog, I think you'll love the book anyway; it's one of the best I've seen in a while. The "Smitten Kitchen" blog was mentioned in passing in an article I read somewhere online. I checked it out half out of curiosity, half out of an aquisitive desire for a larger stock of relatively simple recipes. I was impressed enough with what I saw to buy this, the author's first cookbook. I subscribe to a popular meal kit delivery service, and one thing that is striking about Perelman's recipes is their base similarity to that service's. I think Smitten Kitchen's assume a higher level of base The "Smitten Kitchen" blog was mentioned in passing in an article I read somewhere online. I checked it out half out of curiosity, half out of an aquisitive desire for a larger stock of relatively simple recipes. I was impressed enough with what I saw to buy this, the author's first cookbook. I subscribe to a popular meal kit delivery service, and one thing that is striking about Perelman's recipes is their base similarity to that service's. I think Smitten Kitchen's assume a higher level of base skill (maybe that's just because there are some baking recipes in this book, heh), and Smitten Kitchen's also often require a food processor, and the service's never do. But other than those little details, the gist is the same: making flavorful, fresh food with a limited number of tools, ingredients, and available space. The cookbook seems to be stretching for the unusual at times, with odd standouts such as cookies with popcorn here and there. I can appreciate the real effort at having recipes besides pork chops* or lasagna or whatever. *actually I believe that she is Jewish, since there's a notable lack of pork in her recipes. There are also a handful of recipes I associate with Jewish delis/cooking like latkes and woven bread. There's an entire chapter of vegetarian recipes. Of the short blog post-like essays before each recipe--about which more in a sec--one that struck me as cool was the one before "ratatouille sandwiches" which talked about Perelman's desire to give vegetarian guests a hearty, filling meal. I appreciate that ethos (rubs big belly) and it put me in mind of the vegetarian banh mi sandwiches my friend made one time, which were also flavorful and substantial. I'm looking forward to trying some of the veggie recipes in the book. On the essays: since I haven't/don't follow the blog regularly, the "upper middle class stay at home mommy"-ness of them wore on me after a while--call me a grouch, but I'm not all that interested in a total stranger's child's food preferences. I started to skip them, or skim them to get to the part where she talks about the actual food and the thought process behind the recipe. Frequent mentions of trips to the local bodega make me wonder if she's part of a gentrifying wave, since she is evidently white. That's mildly troubling to me, although maybe Manhattan simply has more corner groceries than we have in our part of the country. Another minor criticism is mainly of the format. At times, photos of the finished dish are a page flip away from the recipe itself, and often you have to flip a page to get the whole recipe. It would be much preferable to me to have the recipe and photo on one page spread, and ditch the essays. But the essays are a popular, friendly-faced feature of the website and they completely have a place in a book marketed to appeal to Smitten Kitchen's fans, so it's an inconsequential gripe. Overall, this is a nicely-produced book and there are more than one or two recipes I'd like to try, so I'm calling this a winner. I started going to smittenkitchen.com about two years ago because I needed a cake recipe. I found the chocolate peanut butter cake recipe (the softest, deepest chocolate cake combined with a sweet, cream cheese peanut butter frosting and topped with a semi-sweet (or dark chocolate) ganache) and I was hesitant to attempt this cake because it looked difficult. However, Perelman makes even the most difficult things wildly simple. She never leaves out important details nor does she neglect to tell y I started going to smittenkitchen.com about two years ago because I needed a cake recipe. I found the chocolate peanut butter cake recipe (the softest, deepest chocolate cake combined with a sweet, cream cheese peanut butter frosting and topped with a semi-sweet (or dark chocolate) ganache) and I was hesitant to attempt this cake because it looked difficult. However, Perelman makes even the most difficult things wildly simple. She never leaves out important details nor does she neglect to tell you how to make the process simpler (for example, she tells the reader to freeze the cakes before attempting to assemble them because the crumb will be too soft otherwise). This book is just as beautiful as Perelman's website is. Her recipes are certainly one of the reasons I wanted this book, but I also wanted it because of her lovely photography and her storytelling ability. For me, and I think for most cooks, food is a story within itself and Perelman's book (and website) is a pleasure to read because she provides small snippets of how food has been a major part of her life. This cookbook is more than just a simple cookbook. Yes, there are the recipes and yes, there are gorgeous photos, but this book isn't all business, and I like that (of course, for some people, this could actually be annoying). Food, like good books, should be shared and celebrated with friends, and it is refreshing to see Perelman combine these two things so flawlessly. The recipes are really fantastic. Anybody can cook following one of Perelman's recipes. I'm not a chef. I don't even know how to properly slice a tomato without either completely destroying the poor fruit or completely destroying my own fingers. But following Perelman's recipes makes me feel like an expert in the kitchen. I would highly recommend this book to chefs and laypersons alike. Even if you don't cook, this book is still a pleasure to thumb through if not for the stories than for the beautiful photography. The book itself is also of a good size and weight so that, if needed, you can hold it open in one hand. Aside from the recipes (the contents has each section as: breakfast, salads, sandwiches/tarts/pizzas, vegetarian main dishes, seafood/poultry/meat main dishes, sweets, and party snacks and drinks), she also includes a section on measurements and a section called, "Build Your Own Smitten Kitchen." This section is indispensable for the beginner (and maybe even the expert) chef because it offers a list of the things one will certainly need in the kitchen. It isn't just a list -- Perelman offers an explanation as to why each thing is indispensable. Perelman also understands cost and so she never insists that you have to buy the very best, very top-of-the-line item in order to make good food. One of the other beauties of this book is that you can go to smittenkitchen.com and check out her recipes, her stories, and her photos before you decide whether or not you want to purchase this book. Perelman also has a section on her site in which she instructs folks on how to maximize space if they're working in a tiny kitchen (which is what she works in). The last thing I will say about this book is that Perelman is NOT a chef. She's a wife and a mother who happens to know a lot about cooking. In her writing, she comes off as honest and sweet and, on her website, you'll find a list of "recipes" that turned out to be disasters for her (because everyone messes up in the kitchen). She doesn't talk down to her readers nor does she pretend to know more than she actually does. Perelman is a great writer, a great cook, and so adorably kind that it's rather difficult to not be smitten with her, her book, or her kitchen. Deb Perelman is the creator of The Smitten Kitchen, a fabulous blog on food and her cooking shenanigans in New York City. This blog (and now book are fabulous if you like pictures of different steps during food prep. Like The Pioneer Woman, Perelman is also a photographer. The pictures in this book are fantastic and the recipes are delicious. I made the Cheddar Swirl Buns (like a savory cinnamon roll), the Apricot Breakfast Crisp (I made mine with peaches and it turned out fine), and I plan on m Deb Perelman is the creator of The Smitten Kitchen, a fabulous blog on food and her cooking shenanigans in New York City. This blog (and now book are fabulous if you like pictures of different steps during food prep. Like The Pioneer Woman, Perelman is also a photographer. The pictures in this book are fantastic and the recipes are delicious. I made the Cheddar Swirl Buns (like a savory cinnamon roll), the Apricot Breakfast Crisp (I made mine with peaches and it turned out fine), and I plan on making the Almond Date Breakfast Bars. Next week we’ll be delving into the Wild Rice Gratin with Kale and the Mushroom Bourguignon. My only beef with this book is that the ingredients and the directions are not always on the same page. I found myself turning back and forth through the making of many of the dishes. This is a minor annoyance, but overall the book was very good and the recipes were simple enough to follow. No weird ingredients and the things that I made already turned out fantastic. What a lovely cookbook, full of delicious recipes that for the most part, aren't too daunting. There are headnotes and color photos for every recipe, and the book is divided into several sections - including two for mains, meat and veggie - and she has some great info at the start of the book and in the appendix. At a glance you might think that these recipes would call for high-end ingredients, but that's not necessarily the case, and this comes across. The author has the same "real life" type What a lovely cookbook, full of delicious recipes that for the most part, aren't too daunting. There are headnotes and color photos for every recipe, and the book is divided into several sections - including two for mains, meat and veggie - and she has some great info at the start of the book and in the appendix. At a glance you might think that these recipes would call for high-end ingredients, but that's not necessarily the case, and this comes across. The author has the same "real life" type approach that we probably all have - sometimes my veggies come from the farmer's market, other times they come from the grocery store or the bodega, either way you can make them delicious. You can also tell how much she has tested and perfected these recipes, which I think is an important step that I think tends to get left out in a lot of cookbooks these days. My interest in Deb Perelman was initially piqued when she came in to do a book talk/signing at the bookstore where I work. Whilst shelving, I was able to overhear much of her journey to self-taught cook and was intrigued. Upon later perusing her cookbooks my interest continued to spike. The gorgeous photographs and accompanying recipes are highly appealing. This is food that begs to be eaten. The hefty tome includes food for all times of day and all occasions, from everyday eats to celebratory m My interest in Deb Perelman was initially piqued when she came in to do a book talk/signing at the bookstore where I work. Whilst shelving, I was able to overhear much of her journey to self-taught cook and was intrigued. Upon later perusing her cookbooks my interest continued to spike. The gorgeous photographs and accompanying recipes are highly appealing. This is food that begs to be eaten. The hefty tome includes food for all times of day and all occasions, from everyday eats to celebratory meals. Definitely a cookbook worth adding to the collection rather than simply taking a screen shot of a select few recipes. There's far too many for that! This is a Goodreads First Reads review. This is a great collection of recipes brought together with a warm sense of humor. The recipes are well laid out and the ingredients list shows the measurements in both imperial and metric, something that is not often done. Her goal is just to have fun cooking, so there is no running around looking for rare ingredients. It just makes you want to get together with friends and family. From a food blogger on Face Book (which I follow). When she announced that she was releasing a SECOND cookbook recently I had to look for the first one. Her Salted Peanut Butter Cookies are amazing! Seriously: the best I've ever made or eaten, and I've eaten more than a few. I have yet to have a recipe from Smitten Kitchen that didn't perform to expectations. User friendly ingredients, creative, approachable, and delicious. ~Alexis S.